Last week, as I prepared for Hispanic Heritage Month to begin, I was looking through the collection of media next to my desk for ideas on what to share next with my children. I found a new DVD from the Families of the World series, and it is awesome. The series reminds me of some of the shows I'd watch and love as a kid. It basically gives you an idea of how children in other countries live by giving you a "sneak peek" of their lives. 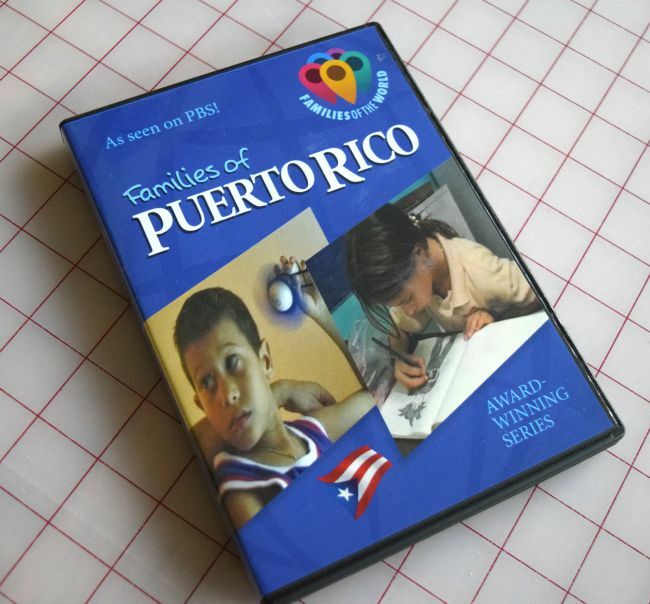 So for instance, the DVD we have is about Families of Puerto Rico (affiliate link). The show follows two children (nine-year-old José and eight-year-old Laura) and their families, letting you learn what a typical day in their life is like. José and his family live in the capital city of San Juan. In the episode, we learn about what his parents do for a living and some of the history of the island. My animal-loving daughter liked him immediately when she learned that he wanted to be a veterinarian when he grows up. Laura's family lives in the country on a farm. We learned about how her parents went to college and studied agriculture and then started their own farm growing bananas and then flowers. My son was absolutely intrigued when he saw how they had two little coquís living in their bathtub and heard their little croaking. (I'm still waiting for the day when I turn around in my shower and find a frog staring back at me.) And both my kids thought it was super cool when Laura's class visited the world's largest radio telescope. There are 28 other Families of the World programs (affiliate link) and they are now available on video - just in time for Hispanic Heritaget Month! They retail for around $10 each and would be great for a school or library collection. The individual videos would be perfect for exploring family heritage, too. Disclosure: I received a copy of this DVD for review purposes. Affiliate links are used in this review. All thoughts and opinions are my own.